22, of Lake, Mich.; assigned to the 728th Military Police Battalion, 8th Military Police Brigade, 8th Theater Sustainment Command, Schofield Barracks, Hawaii; died Nov. 13 in Mosul, Iraq, of wounds sustained when enemy forces attacked his unit using small-arms fire. HONOLULU — The Pentagon says a Hawaii-based soldier was killed Nov. 13 when his unit was attacked in Iraq. Pfc. Casey P. Mason, of Lake, Mich., was fatally wounded by small-arms fire in Mosul. The 22-year-old Mason was assigned to the 728th Military Police Battalion, 8th Military Police Brigade, 8th Theater Sustainment Command, at Schofield Barracks. Mason joined the Army in October 2006 and was assigned to Schofield in April. His company deployed to Iraq in September. A memorial service is to be held in Mason’s honor next week at Schofield. 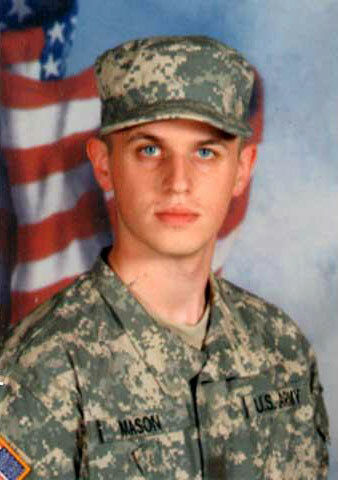 MOUNT PLEASANT, Mich. — Lux Funeral Home will be handling one of its own when the body of Army Pfc. Casey Mason returns from Iraq. The 22-year-old from the Clare County community of Lake went to work at Lux Funeral Home after graduating from Farwell High School. He joined the Army last year and was assigned to a military police unit based at Schofield Barracks, Hawaii. Mason was killed Nov. 13 when enemy forces attacked his unit with small-arms fire in Mosul, Iraq. Former classmate Carrie Kendrick recalled debating politics with Mason while riding the school bus. “He would always say he was going to run for president, and he’d tell me how he planned to change things,” Kendrick told The Saginaw News. “He’d talk about how things were going to be different when he got” to the White House. The funeral home said Nov. 16 that services for Mason would be held soon.